This week, the three American childhood friends who overpowered a man wielding an assault rifle and a box cutter on a passenger train to Paris are starring in a Clint Eastwood movie about the attack, and it’s feeling a little surreal. 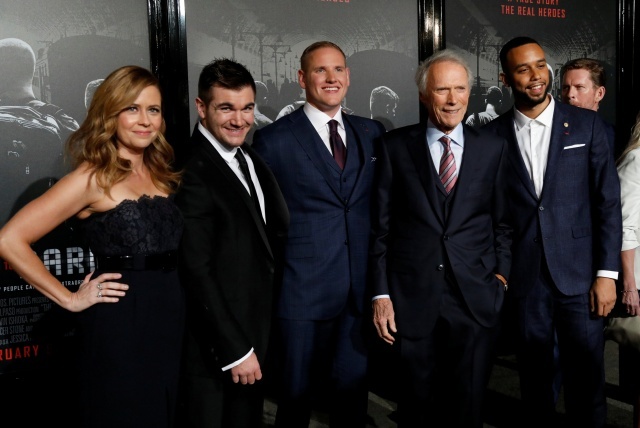 Spencer Stone, Anthony Sadler and Alek Skarlatos from Sacramento, California, play themselves in the movie “The 15:17 to Paris,” opening in U.S. movie theaters on Friday. After meeting the three men in their 20s at an awards show, Eastwood decided to make a film, but rather than casting actors, the Oscar-winning director called on the friends themselves. “Three weeks before shooting, he’s like ‘Do you guys want to do it yourselves?’ and we were like ‘What? The movie starts in three weeks and we never took acting classes,'” Sadler said. “(Eastwood) was like ‘Don’t worry about it. We’re just going to go and do it.’ So he just kept it simple and said ‘Be yourself and we’re just going to capture it’,” he added. The trio were on a train from Amsterdam to Paris on a European vacation on Aug. 21, 2015 when a suspected Islamist militant opened fire on passengers. They helped overpower the man, and Stone plugged the wounds of another passenger with his fingers after being struck himself by the attacker. Two other passengers were wounded and the attacker was arrested when the train stopped. “A lot of the times the story is depicted that we were the only ones who did anything,” he said. “For them to be honored for what they did in such a big way is awesome because it’s something we’ve always wanted but we just didn’t know how we could do that. “We just wanted to get it right and I think we did,” Stone added. But the trio is also hoping it opens other doors.